A crackling fire in your very own fireplace is the best way to add warmth and comfort to any room. When there is no fire in the fireplace, your fireplace can continue to be the centerpiece of your room with a fireplace mantel designed by SoCal Fireplace Mantels, your premiere source of fireplace mantels in Thousand Oaks. SoCal Fireplace Mantels, Thousand Oaks fireplace mantels provider, has dozens of designs of mantels and surrounds, including mantels in the French country style, the British colonial style, the Art Deco style, modern fireplace mantels, and everything in between. With so many styles to choose from, you are sure to find a design that is ideal for your home or for your business. In addition to the large variety of designs of fireplace mantels in Thousand Oaks, SoCal Fireplace Mantels also creates mantels from a variety of different materials. Choose from natural stones such as marble, sandstone, travertine, granite, and more. These natural stones are available in a number of colors to suit your tastes, from distinctive peach marble to dramatic crimson marble and snowy white marble, among others. 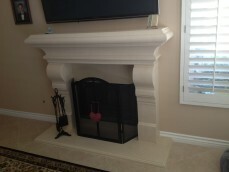 Cast stone mantels are also available for those who prefer a uniform color and design throughout the stone. If you need a new fireplace mantel, call SoCal Fireplace Mantels, Thousand Oaks fireplace mantels provider, to learn about your options for fireplace mantel remodeling. Our skilled design representatives can come to your home and help you decide on one of the fireplace mantels, or help you to create a custom fireplace mantel that is ideal for your home or business. If you are not sure what you are looking for, stop by our showroom to view all of our options for fireplace mantel designs in person. Our knowledgeable design associates will be glad to explain your options to you as well as show you all of the designs and materials to choose from. Alternatively, call to request that a catalog is sent to your home, allowing you to shop in comfort and privacy. 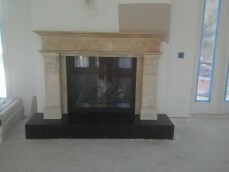 Trust SoCal Fireplace Mantels, Thousand Oaks fireplace mantels provider, for all of your needs for fireplace mantels. We offer the largest variety of materials and designs, and our helpful associates are glad to help you each step of the way through your fireplace remodel.